All transactions are safe and secure with a reliable history in online purchasing behind each of our associates. Buy the Bill Compton t-shirt to own True Blood clothing and merchandise. Most humans assume that vampires are cold and deadly, but not Sookie. She has found the light of her life in Bill Compton (Stephen Moyer), a vampire that can't see the light of day. Whether Bill is having a Tru Blood drink at Merlotte's Bar and Grill, or escorting Sookie to the vampire bar Fangtasia, he has her best interests at his never-beating heart. Whether you prefer to watch the True Blood Season One DVD, or curl up with a Sookie Stackhouse book, the story will tug at your heart. 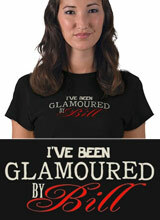 Grab this Bill Compton shirt to show that you are pro-vampire. In addition to the Bill Compton tee above, browse the True Blood Clothing Gallery for more apparel like men's and women's clothes, kids shirts or hoodies.